With only five days remaining until showtime, the world’s most prestigious mixed martial arts promotion has announced Saturday’s “UFC on FOX: Evans vs. Davis” event inside United Center in Chicago, Illinois has officially sold out. The UFC did not confirm how many seats were made available, but the venue can hold roughly 21,000 fans. The total in attendance will defend upon how the arena will be configured on Saturday. The organization hasn’t held an event in the Chicago area since 2008. UFC 90 took place at the Allstate Arena in Rosemont, Illinois and featured a middleweight title tilt between reigning king Anderson Silva and Patrick Cote. 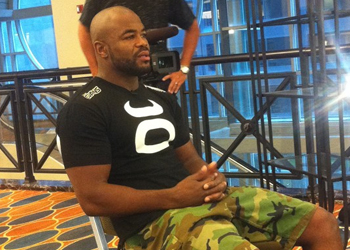 The Octagon’s return to primetime television features a light heavyweight affair between Rashad Evans (Pictured) and Phil Davis. A middleweight top contender shootout with Chael Sonnen and Michael Bisping co-headlines the freebie fight card. FOX will air the main card live starting at 8PM ET/5PM PT.